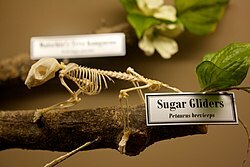 Around the world, the sugar glider is a popular domestic pet. It is one of the most commonly traded wild animals in the illegal pet trade, where animals are plucked directly from their natural habitats. 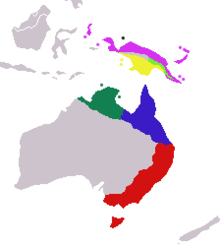 In Australia, sugar gliders can be kept in Victoria, South Australia and the Northern Territory but not Western Australia, New South Wales, ACT or Tasmania. Sugar gliders are most popular as pets in the United States, where they are bred in large numbers. Most states and cities allow sugar gliders as pets, with some exceptions. In some places, a license or permit might be needed to own a sugar glider, because they are considered an exotic pet, or wild animal. Wikispecies has information on: Petaurus breviceps. Wikimedia Commons has media related to Petaurus breviceps. ↑ Australasian Marsupial & Monotreme Specialist Group (1996). Petaurus breviceps. 2006 IUCN Red List of Threatened Species. IUCN 2006. Retrieved on 12 May 2006. ↑ "Insider the exotic pet trade: fatal attractions". discovery.com. Retrieved 2010-10-22. ↑ "Summary of State Laws relating to private possession of exotic animals". Born Free USA. Retrieved 24 October 2012. Videos of sugar gliders in the wild by BBC Natural History Unit. (Only natural sounds - no talking). This page was last changed on 10 November 2015, at 18:14.